Throughout the Arctic, ice wedges are thawing at a rapid pace. Changes to these structures, which are very common in permafrost landscapes, have a massive impact on the hydrology of the tundra. This is the result of a study carried out by an international research team in cooperation with the Alfred Wegener Institute, Helmholtz Centre for Polar and Marine Research (AWI), which will be published in the journal Nature Geoscience today. Ice wedges are a major feature of the Arctic permafrost landscape: They extend up to 40 metres into the ground and formed over the course of hundreds to thousands of years. Freezing and melting processes are responsible for the ice wedge polygon structures in the Arctic lowlands typically found in permafrost. A team of researchers around lead author Anna Liljedahl of the University of Alaska in Fairbanks has compiled and analysed the results of field studies and remote sensing analyses carried out around the polar circle. They found that even very brief periods of above-average warm temperatures can cause rapid changes to near-surface ice wedges in the permafrost. In nine out of the ten areas under investigation, the international research team, using historical aerial images and the latest high-resolution satellite data, observed that ice wedges thawed near the surface and that the ground subsided as a result. "The subsiding of the ground changes the ground's water flow pattern and thus the entire water balance", says Dr Julia Boike, permafrost researcher at the Alfred Wegener Institute, and one of the researchers involved in the study. "In particular runoff increases, which means that water from the snowmelt in the spring, for example, is not absorbed by small polygon ponds in the tundra but rather is rapdily flowing towards streams and larger rivers via the newly developing hydrological networks along thawing ice wedges", the scientist explains. Model calculations performed in the study suggest that the Arctic will lose many of its lakes and wetland areas if the permafrost retreats. "At first glance, the thaw in these areas does look insignificant, because the subsidence is often only a few decimetres", co-author Dr Guido Grosse, also based at the AWI in Potsdam, adds. However, the reorganisation of the flow pattern associated with the subsidence of the ground causes rather dramatic hydrological changes. This results in changes to the biochemical processes, which very much depend on ground moisture saturation. "We are currently observing how a permafrost-dominated system is changing into a hydrologically more complex system that is less permafrost-dominated", says Grosse about the investigations. The permafrost contains huge amounts of frozen carbon from dead plant matter. When the temperature rises and the permafrost thaws, microorganisms become active and break down the previously trapped carbon. This in turn produces methane and carbon dioxide, which accelerates the greenhouse effect. These processes have already been investigated for slow and steady temperature increases and near-surface thawing of permafrost. However, thawing ice wedges locally lead to massive changes in such patterns. 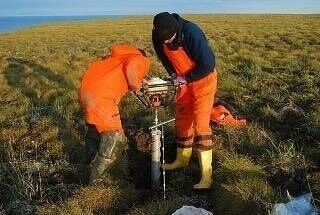 "The future carbon balance in the permafrost regions depends on whether it will get wetter or dryer. While we are able to predict rainfall and temperature, the moisture state of the land surface and the way the microbes decompose the soil carbon also depends on how much water drains off", says Julia Boike. Guido Grosse adds: "The processes that we have identified during these investigations and that we have modelled on local scales now can and have to be integrated into the large land surface models to allow us to better predict hydrological and biochemical processes. There will also be an indirect influence on the Arctic infrastructure, part of which is built in regions rich in ice wedges and which will thus be affected by their thawing."